Few brands are born Ueber-Brands. Like most humans, most brands start out wanting to do a good job and establish themselves. It’s only later that some of them feel the need to ‘dig deeper,’ find a higher calling and sharing it in meaningful ways. How better illustrate the way such Ueber-Brands shape up than to track a real brand in this development? Young Chobani looked like an Ueber-Brand-in-the-making to us when we first researched it for our book a few years ago – and it does so even more so today. While the focus- and foundation for its rapid rise certainly was a standout product, the company’s early decisions also reflected beliefs which support the higher mission it has started to formalize and communicate over recent years. Select elements of the founder’s personal background and the brand creation story also combine to shape a brand myth that supports the mission. 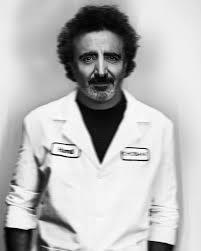 Chobani was founded in 2005 by Hamdi Ulukaya, son of a Kurdish dairy farmer in Turkey who emigrated to the US in the face of political and anti-Kurdish repression. If he had chosen to study first political science in Istanbul and then business in Albany, it was not to follow in the footsteps of his father and go back to the land of the çoban – the shepherds. But then, he could not help but agree with him that the fresh cheeses and yogurt in his new home country tested terrible. Generally, a fat- and texture free, sweet but bland substance. It compelled Ulukaya to started a small feta-making company that quickly grew into a successful regional supplier. One day – so the story goes – he received a postcard announcing an auction for a 90 year–old former Kraft dairy plant an hour away. The card immediately landed in the trash but, somehow, Ulukaya decided to fish it out again later… and ended up buying the plant a few weeks later with the help of a small business government loan. Do you smell a Myth in the making? Mythologists would talk about ‘the Calling’ followed by ‘the Inspiration.’ What followed were some 18 months of trials and tribulations (the Challenges) in which Ulukaya (the Hero) his Kurdish yogurt master Dogan (the Mentor) and a few Kraft alumni (the Helpers) struggle through to concoct and make a shelf-stable ‘labneh’ – a strained yogurt (more on brand Myth making here). They labelled it ‘Greek yogurt’ for easy reference and branded it Chobani, a link back to Ulukaya’s roots and to a deeper meaning we will see shape up below. Ulukaya insisted that his yoghurt be sold in supermarkets, rather than at specialty grocers and delicatessen, and that it not hidden in the ethic food section. To make an impact he wanted it smack in the middle of the regular dairy shelf. And the tart labneh quickly gained traction behind the enthusiastic reception by a until now taste- and texture deprived population. Their spreading the word and driving up sales made retailers around the nation want in on the boon. Chobani obtained near complete national distribution within two years and within another six competed with Dannon for the number one spot, with sales reaching $2bn or about one in every five yogurts. And that despite selling ‘Greek’ only and charging some $1.30, a 40-100% up-charge versus the ‘regular stuff’ (see business development timeline in the notes). But far beyond its own business, Chobani fueled the appetite for- (and multi-billion-dollar industry of) wholesome, artisan, slow(er) foods. Today, any proud supermarket shelf will feature a Greek yogurt from any of the big manufacturers as well as Australian-, Icelandic-, Bulgarian-, almond-, tofu- skyr- and/or other ‘exotic’ dairy concoctions at $2, $3, $4 per jar and more. Which also bears the question what Chobani can do to continue to stay special and grow. Compared to many Ueber-Brand benchmarks, the founder of Chobani was set on not letting growth be constrained and provide an opening to ‘Big Food’. There seemed to be little time to think about brand causes beyond scaling the business. Yet, from the beginning, Ulukaya instinctively paid attention to choosing ‘good’ ingredients and to treating the people the local communities involved well. He cared particularly for the workers with humble backgrounds like himself – including immigrants, which he made a point of hiring. Ulukaya was not shy about taking a stance on related issues like animal welfare, minimum wages or immigration. Most mass marketers avoid such moves for fear of distracting or even ‘alienating’ parts of the consumer population. We think, however, that Chobani brings the ‘softer side’ of the brand to the fore just at the right time to continue to appeal. To stay special through product alone becomes ever harder in today’s hyper-active (and Chobani-inspired) food fight. 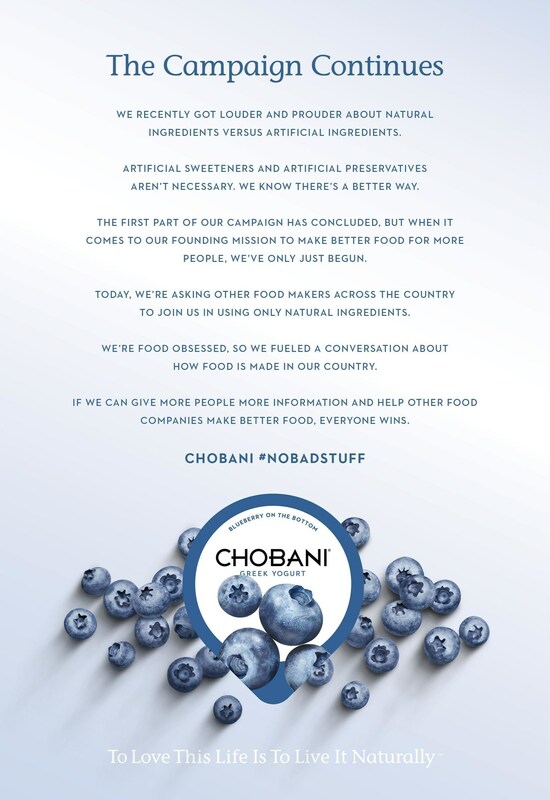 That said, Chobani can not let go of indulging its followers in exciting, wholesome foods (see our note at the end). Beyond giving people tasty yoghurt, Ulukaya sought to make them pay attention to how- and what it is made of. From early on, Chobani distanced itself from ‘food industry’ practices like using growth-hormones on cows or gene manipulated ingredients. It made practices that respect the animal’s welfare the basis for working with farmers. Working with local family farmers and, in the process, reviving a rural area in upstate New York that was losing jobs, its young and hope became another key narrative. To this day it is exceptional to see ‘start-ups’ engage in manufacturing, particularly in the countryside and involving largely unskilled labor. Many of the early decisions might have been guided by an inbred affinity for (those) ‘living off the land.’ Today, however, Ulukaya and the people in charge of communications are very conscious of the resonance this mix of American Dream and Rural Renaissance story has with many people. A brand mission with three core elements has emerged from the above creation story and the brand’s DNA: (1) There is the outspoken “mission to bring high-quality yogurt to more people and create positive change in our country’s food culture,” (2) the efforts to exemplify how modern companies should treat employees, suppliers (including the animals) and the communities they operate in and (3) specifically, actions meant to spur other companies and people to help abate the consequences of the global refugee crisis and related racial or religious tensions. All three elements go far beyond ‘providing a good yogurt.’ They play different roles when it comes to touching brand stakeholders and the public and hence are sometimes communicated through different media. The ‘good food for all’ mission is at the top of the brief when it comes to the broad-reaching brand content on the website, social media, ads, lids and labels and through the formulation of the product. “The Chobani Way” is described as minding the Environment, the Animals and “democratizing good food and wellness.” One of several activist moves to promote food culture change has been the creation of a “Chobani Incubator” that provides free capital grants to “small companies with big hearts and ideas that challenge the food industry and improve broke systems.” Others are executed through the “Chobani Foundation” which looks to educate the public on good nutrition, distribute food in zones struck by disasters or serve meals to the poor on occasions like Thanksgiving. Of course, ‘good food for all’ also neatly covers the company goal to drive growth through household penetration and consumption. Like other food brands, Chobani is extending into new flavors and product forms now like Flips or drinks and is propagating creative ways to use them for cakes, shakes, ice cream, etc.. Three ‘Chobani cafes’ have sprung up in New York and Houston which allow the company to physical manifest its good-food believes, experiment and to be closer to some of its biggest fans. They are also a test for how far the business model and mission can be stretched beyond cups on a shelf. And then there is the very personal and passionate desire by the founder to extend the ‘wellness’ to refugees. This cause might be the furthest removed from making dairy products but at the same time it is the most distinctive and emotional mission associated with the brand, right now. FastCompany reported in 2016 that some 30% of Chobani’s then 2,000 employees had a refugee background and quotes Ulukaya as saying that “It’s a good thing to do, and on the business side, it’s a smart thing to do. These are the most hardworking, patriotic, honest people. They will give everything they have.” He started to seek them out after being impressed with a group of temporary workers he had agreed to have bussed down to the plant from a refugee resource center in 2010. But the efforts to convert ‘refugees’ into ‘working citizens’ do not stop there. In 2015 Ulukaya created the Tent Foundation to mobilize the private sector around the world to follow his example. Again, the company is not shy to report on this engagement and to celebrate when its founder is recognized as happened in 2016 with the JFK ‘Ripple of Hope’ award or in 2017 with the King Center ‘Salute to Greatness’ award. But the communication will be directed more to news- and professional oriented networks such as LinkedIn or Twitter, rather than broad consumer-context platforms like Facebook or their website. No matter which facet of this hefty mission you look at, Chobani and its founder truly put their money – and more – where their mouth is, making it substantive and making it ‘real’. Chobani has spent millions and has been criticized by conservatives for many of their pro-labor and pro-refugee actions. Members of the increasingly vocal ‘Alt-Right’ have tried to shame the brand on social media and asked for people to boycott it. The far-right website Breitbart tried to link refugees working at Chobani with a tuberculosis outbreak and published articles like “Yoghurt Tycoon vows to choke the US with Muslims.” Ulukaya even received death threats. But he says he won’t give in to the bullying and that it illustrates the need to advocate for more tolerance. It is these believes upheld and the ‘authenticity of purpose’ that elevates the brand onto a higher level in the eyes of involved consumers and stakeholder (an emerging ‘Ueber-Target LINK) and reminds us of activist Ueber-Brands like Ben & Jerry’s or Patagonia (link). The founder and his brand get showered with declarations of support, far outnumbering the critiques and resilient sales to underscore it. To close, let’s get back to the myth… The reference to the çoban, the shepherd, in the brand name has taken on a lot more meaning in the context of the brands mission and actions. The ‘About Us’ section of the brand website says, Ulukaya wanted to endow the company “with the hard-working and compassionate spirit of the mountain farmer.” That compassion is elevated to a mythical level through the Kurdish legend about “shepherds sharing unexpected gifts with strangers and not asking anything in return,” which Ulukaya likes to recount (see the YouTube video below) and put at the heart of his “Shepherds Gift Foundation”. But as with all compelling characters, Ulukaya and Chobani have more complexity and in-build tension to them. Rather than just being do-good-man, Ulukaya likes to see himself as both, “a shepherd and a warrior,” as he told FastCompany. What emerges is the image of a warrior fighting ‘Big Food’ with its bad-tasting, un-healthy products and its inhumane treatment of animals with one arm, while shielding its employees, consumers and the weaker members of society with the other. And who would not root for such a hero, … while enjoying a tasty and wholesome treat? The powerful part about the Chobani Mission and Myth is that they are anchored in believes that have been acted-out consistently over the past decade and that are starting to form a ‘Truth’ that is harder to imitate by new ‘good-for-you, good-for-all’ propositions jumping the band wagon now. Consumers increasingly look ‘behind the facade’ and see more than an ad campaign propping it up. For deeper insights and guidance on how to elevate a brand to Ueber-Brand status, read our book “Rethinking Prestige Branding – Secrets of the Ueberbrands” and other articles and case-studies on this blog. Product – For the strengthening of the mission and myth to be meaningful Chobani needs to also continue to translate them to outstanding products. Just as we finish this article, we have noticed a soft spot behind a change in line-up, packaging and artwork (01/2018) that seems to have let some brand fans down in the experience. This must be addressed. Also, the wide-mouthed cup of ‘Greek’ has lost uniqueness with so many imitators on shelf. 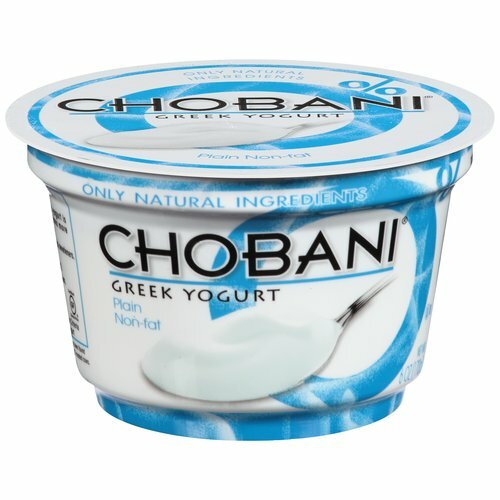 Chobani needs to look build icons that uniquely represent the brand, it’s mission and myth. Think of a pint of Ben & Jerry’s ‘Cherry Garcia’ or ‘AmeriCone,’ or Red Bull’s blue and silver bullet can. Ueber-Target – We see a sharpening of the type of people Chobani has in mind when designing their product, message and manifestations – the ‘Ueber-Target’. We describe them as ‘food-loving Liberals,’ at this point. However, this Ueber-Target could be sharper and make the brand stronger. Think of Red Bull giving ‘Daredevils’ wings, Harley Davidson’s ‘Outlaws’ or Patagonia’s ‘Activist Explorers’. The Mission – is ambitious but broad and multi-layered. A focus on few elements that relate strongly to the product would help boost brand impact. For example, an external focus on the ‘democratization of wellness through good food.’ Patagonia has been a pioneer in many employee benefits areas, has been one of the first b-corporations, etc. but the focus externally consistently lies on how its products and their wearers can protect the environment we all should explore. The power of the Total Picture – or – How Product Performance is not everything. One can call Fage’s Greek Yoghurt the true ‘original’, since it had arrived in the US a decade before Chobani was founded and belongs to a Greek company that has been in business since 1926. And Fage is actually made of even more milk: 4 cups for every cup of stained yoghurt (versus the 3 for Chobani), which makes it even richer tasting than the new kid on the block. But ‘more performance’ is not what defines the ‘best’ (alone). For one, Fage had allowed itself to be stuck in delicatessen stores and the exotic foods isles of some supermarkets. Also, Fage had not been able to harness the devotion of its expat and gourmet buyers while Chobani invested into provoking and spreading word of mouth about this indulgent product broadly and then started to also talk about how and why it was made differently. 2007 Five employees. The first 300 cases leave the plant. Dannon and Yoplait have a 71% share, Greek Yogurt 2% – owned by Fage. Chobani sells directly to Grocers and insist on being in the REGULAR yogurt section (not organic or delicatessen). It charges $1.30 – high enough to recoup cost but not so high that classic makers can easily undercut. 2008 Chobani volumes explode behind string consumer demand and rapid expansion to full distribution. They reach 11 million cases/year by 2009. 2011 62 million cases/year. Becomes #1 Greek yogurt brand in the US, extends into Australia as first international market. Acquires a dairy farm and plant in Australia. 2012 Exceeding $1bn in sales (+50%), Greek yogurt is now 36% of $6.5 billion yogurt market. Chobani has a 17% national share and employs some 3000 employees. 2013 Announces $450 million investment into a plant in Idaho hat will have a capacity of over 50 million cases a year. Ulukaya says he needs to grow ahead of the big competitors, or be crushed. 2016 Chobani sales reach $2 billion also behind successful new product introductions like Flips, Dips and Drinks. It makes Chobani the #2 yogurt manufacturer in the US with a 20% market share, ahead now of Yoplait and behind Dannon and that while selling only ‘Greek’ style yogurts. That category continues to grow, but Chobani’s has slipped below 40% sub-category share. The new, 2018 version of Chobani’s artwork. – Softer, more artisan. Gallery | This entry was posted in 1 - Mission Incomparable - The first rule is to make your own, 3 - From Myth to Meaning - The best way up is to go deep, 4 - Behold! - The product as manifestation, 5 - Living the Dream - The bubble shall never burst and tagged Chobani, cultural strategy, Hamdi Ulukaya. Bookmark the permalink.